Charleston velvet band with a Feather A product hand-made locally by tailors in the area of Venice, comes with warranty certificate of authenticity and origin. Charleston velvet band with hearts A product hand-made locally by tailors in the area of Venice, comes with warranty certificate of authenticity and origin. Charleston lace and satin band A product hand-made locally by tailors in the area of Venice, comes with warranty certificate of authenticity and origin. Charleston fan with marabou feathers A product hand-made locally by tailors in the area of Venice, comes with warranty certificate of authenticity and origin. Charleston velvet band with a side bow A product hand-made locally by tailors in the area of Venice, comes with warranty certificate of authenticity and origin. Long muff with lace flounce, fastening with elastic string. A product hand-made locally by tailors in the area of Venice, comes with warranty certificate of authenticity and origin. 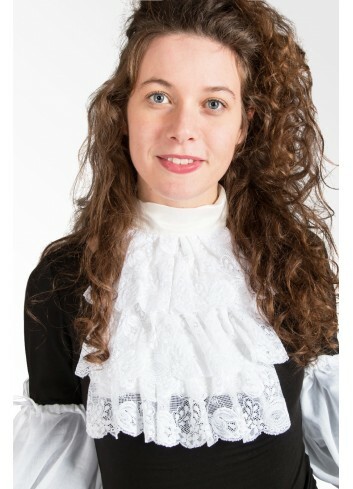 Genuine lace Jabot fastened with long thin ribbons (double wind on the neck) A product hand-made locally by tailors in the area of Venice, comes with warranty certificate of authenticity and origin. 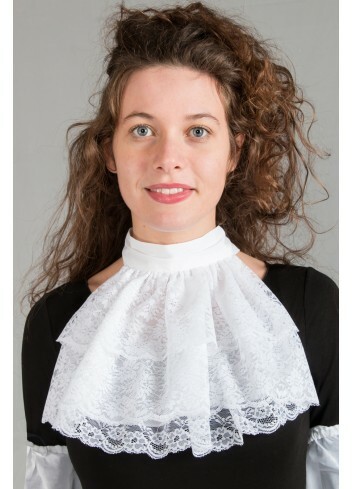 Genuine lace Jabot fastened with a simple band A product hand-made locally by tailors in the area of Venice, comes with warranty certificate of authenticity and origin.